This is part of an ongoing collaboration with National Trust gardeners and volunteers in The Walled Kitchen Garden in Clumber Park, Nottinghamshire. The Walled Kitchen Garden holds over 130 varieties of rhubarb, making it the second largest collection of rhubarb in the world. Unfortunately when the leaves grow up and flop over it is hard to see the differences between the varieties, so in response we wanted to tell the visitors stories to uncover the rhubarb varieties in the collection. 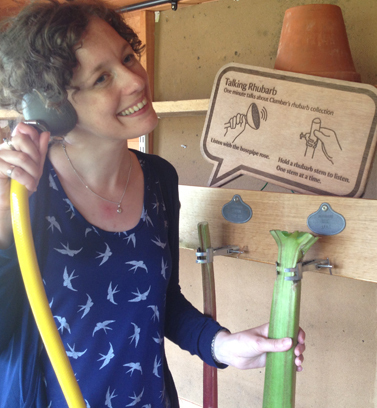 The Rhubaphone was made in collaboration with National Trust gardeners. When someone touches the rhubarb it triggers a recording of the Head Gardener talking about what makes that variety special. Some of the varieties in the collection are rare because they don’t suit commercial production or they produce small yields, yet they carry stories about people and places and are a valuable part of our cultural heritage. The collection at Clumber includes Buck’s Early Red, the first culinary rhubarb selected from a wild rhubarb species and Livingstone, a bright red variety is named after “Red” Ken Livingstone, the politician. The idea of the Rhubaphone is to pick out some stories to tell from the collection. 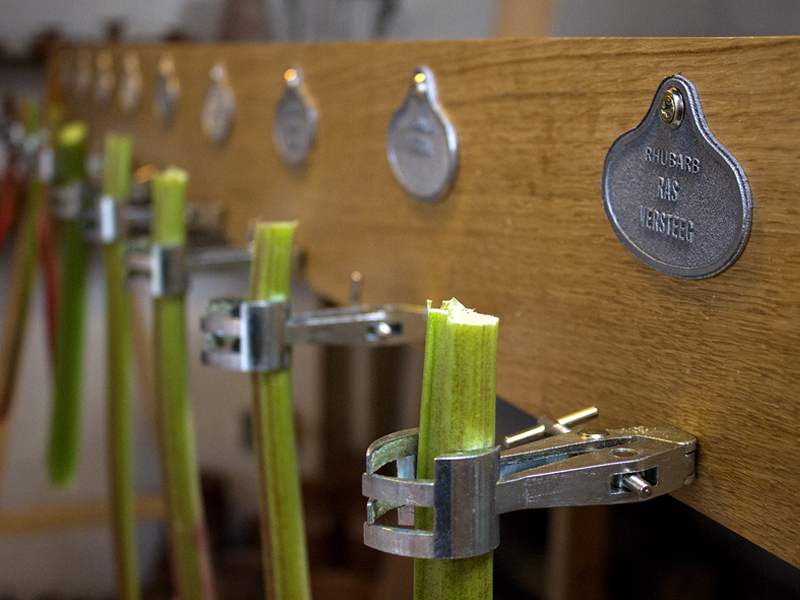 The most recent version of the Rhubaphone, shown in the photo at the top of the page, has rhubarb stems clamped side by side, so the differences between the varieties can be seen more closely. The leaf stems are connected with wires to a Bare Conductive Touch Board. This is joined via a hosepipe to a speaker, concealed in a watering-can-rose. Holding the rhubarb in one hand and the watering-can-rose listening-device in the other visitors can listen to the rhubarb stories. 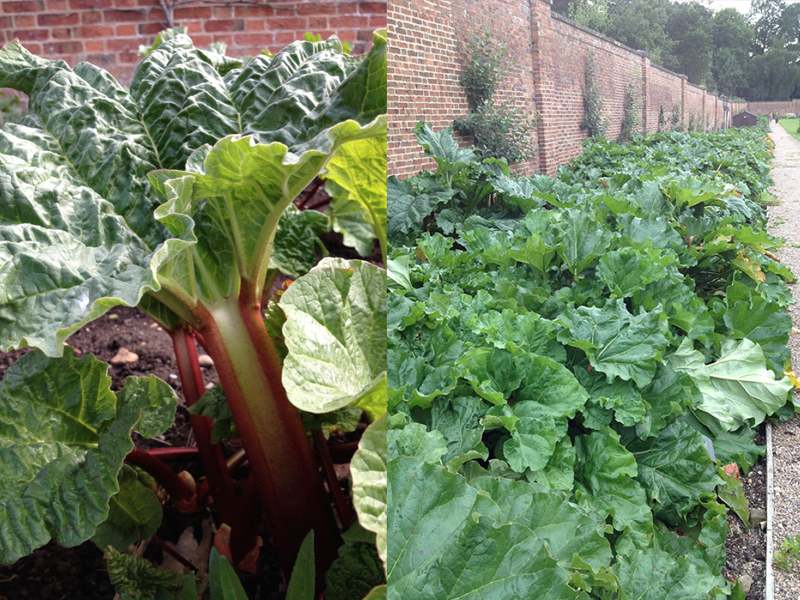 The Rhubaphone is in the Walled Kitchen Garden at Clumber Park throughout the rhubarb season. The design process has been shaped by values drawn from critical philosophy of technology. The Rhubaphone is intended to create a pause and draw attention to the particularities of the rhubarb varieties. It is also designed to stimulate sensory connection through touch and smell as well as visual cues. The initial design resembled a Xylophone, prompting the name Rhubaphone. The name stuck but the design evolved. The box shape dominated the rhubarb leaf stems so we tried a thinner version, but the interaction felt clunky because of the wide variation in the rhubarb stems. 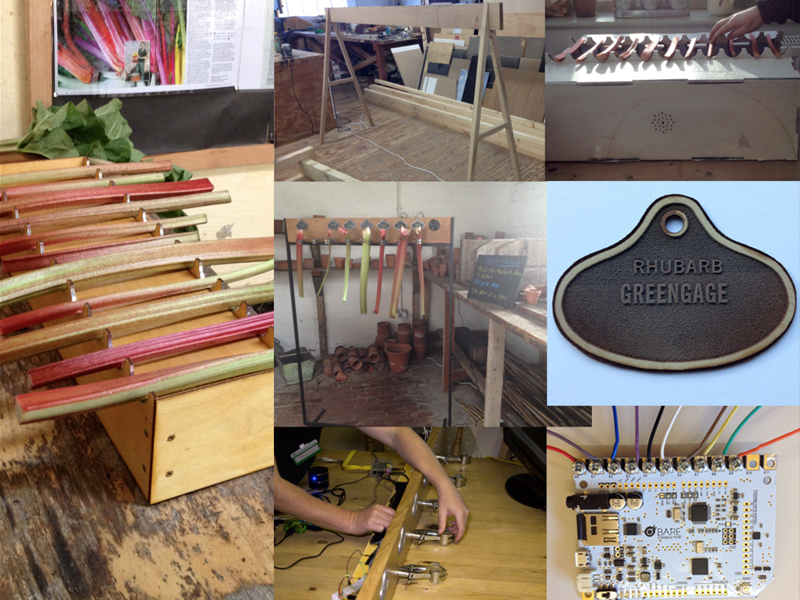 Input from Cerys Alonso and Dave Jones at North Wales School of Art & Design stimulated the clamp design, including labels inspired by designs found in the garden’s museum. Along the way a musical wind chime version has been trialled. The current design has grown in size and has moved from a location in the glasshouse to a shed beside the rhubarb beds. It is important that the wooden frame is oak from Clumber Park and that the aesthetic is drawn from the garden. This helps to root it in its place. The technology has changed as the physical design has been modified. The first version used an Arduino Uno, a Sparkfun MP3 Player and an MPR121 Capacitive Touch Sensor Board and the next replaced the Mp3 Player with a Raspberry Pi. 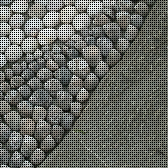 The current version used a Bare Conductive Touch Board, which simplifies the construction and is quicker and easier to maintain in the garden environment. The Rhubaphone has grown into its location and the hope is that it will continue to grow and respond to the needs of visitors and garden.